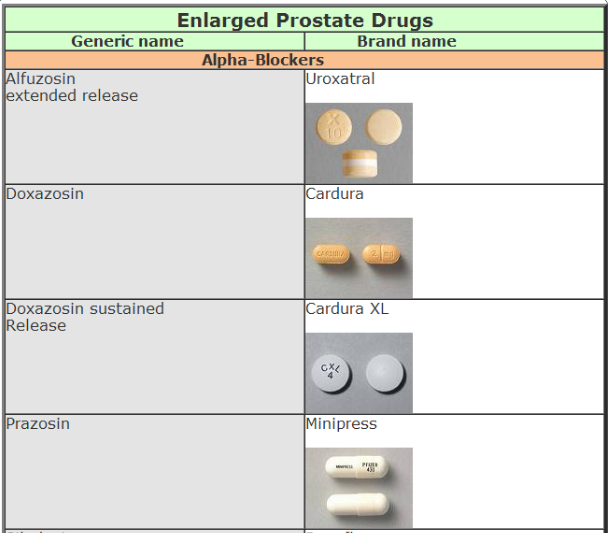 What are the Enlarged Prostate Drugs? What can they do to shrink the prostate? How far can they affect positively enlarged prostate? What are their side effects? Have a complete guide in the following paragraphs. Unfortunately, about 50% of men suffering from enlarged prostate or benign prostatic hyperplasia (BPH) show symptoms that require their treatment with drugs. Usually, this percentage increases with aging. This means that billions of men all over the world are taking drugs for enlarged prostate or any other therapies to relief Enlarged prostate symptoms. Usually, doctors prescribe alpha-blockers as first line of treatment for enlarged prostate symptoms. of their fast relief of most of BPH symptoms. About sixty percent of men treated with alpha-blockers notice improvement in their condition after few days or weeks. Also, alpha-blockers are cheaper than 5-alpha-reductase inhibitors.Doxazosin (Cardura), prazosin (Minipress), and terazosin (Hytrin), are the 3 oldest alpha-blockers found in the market. Prazosin is not generally used to treat BPH, as it is approved by Food and Drug Administration (FDA) as a drug to treat hypertension. But, prazosin is your drug of choice to treat your urinary problems if you are suffering from BPH and elevated blood pressure at the same time. The three newest alpha-blocker drugs are alfuzosin (Uroxatrol), tamsulosin (Flomax), and doxazosin-sustained release (Cardura XL). These enlarged prostate drugs are available in slow release or continuous release forms. 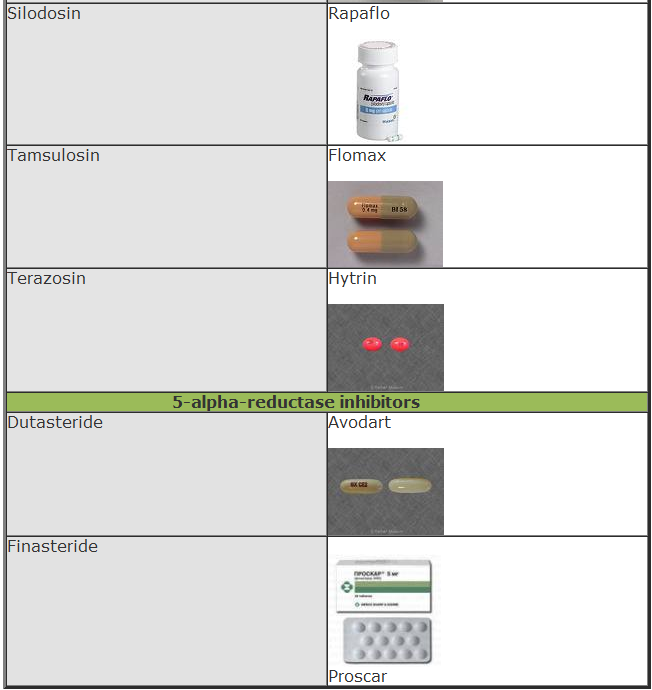 In late 2008, FDA approved silodosin (Rapaflo); it is the newest alpha-blocker in the `market now.Finasteride (Proscar and generic) and dutasteride (Avodart) are the two 5-alpha-reductase inhibitors sold in the market. Propecia is a finasteride drug (but in lower dose), which is approved by FDA to treat baldness, so it is actually not one of drugs for enlarged prostate. How do enlarged prostate drugs work? Both alpha-blockers and 5-alpha-reductase inhibitors work in completely different ways. Alpha-blockers cause the relaxation of muscles of the bladder and surrounding tissue, resulting in easy painless pass of urine. On the other hand, the 5-alpha reductase inhibitors can cause the shrinkage of enlarged prostatic tissue by blocking or stopping the abnormal production of DHT hormone (most potent form of testosterone, which causes swelling of prostatic tissues). The 5-alpha-reductase inhibitors take a longer period of time to treat the BPH symptoms (from six months to one year), but they show more success in treating extremely enlarged prostates. The main advantage of 5-alpha-reductase inhibitors is that they are suggested to lower the risk of having prostate cancers. 3. Reduce PSA (prostatespecific antigen), which is used to detect prostate cancer, causingdifficulty to diagnose these types of cancers. From thousands of years, herbs are used to treat urination problems associated with BPH. These herbs might include; saw palmetto, rye-grass pollen, beta-sitosterol and pygeum africanum. Some recent researches argue the effectiveness of such treatments; therefore, it is very important to seek your doctor advice before taking these herbs.